Is Fiberglass a Suitable Aluminum Alternative? Aluminum was first adopted in construction in the 1920s when architects started driving skyward. It rapidly became something of a legacy material in the sector, after providing the structural framework for some of the world’s tallest buildings. High corrosion resistance, exceptional strength to weight ratios, and good formability made aluminum the material of choice for modern day construction of skyscrapers and aesthetic, functional, cost-effective structures. In fact, as much as a quarter of the world’s produced aluminum is consumed by the construction industry. Fiberglass has been touted as a potential aluminum alternative for years, providing similar properties to the metal. Both are tough, lightweight, and highly formable. This blog post will compare the mechanical characteristics of various products to decide if fiberglass really is a suitable aluminum alternative. Structural fiberglass shapes are typically manufactured through a pultrusion process while aluminum I-beams and complex profiles are commonly extruded. Each of these can be used to produce near net shapes with high flexural strengths for load-bearing applications. The metal boasts the higher flexural strength of approximately 35 KSI but is as much as 30% heavier than fiberglass. Fiberglass is, therefore, stronger on a pound-for-pound basis in terms of lengthwise flexural strength. This makes fiberglass an excellent consideration for an aluminum alternative for structural shapes as it provides an outstanding combination of weight and strength. 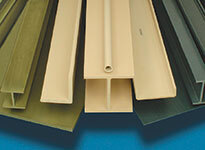 Fiberglass is often an ideal aluminum alternative for industrial gratings. DURADEK® grating boasts an ultimate load capacity of up to 1784 PSF, more than double that of aluminum grating, while DURAGRID® Phenolic outmatches aluminum in terms of loading capacity by a factor of almost four to one. Aluminum is an electrical and thermal conductor, requiring unique considerations to ensure the material is suitable for application in certain environments. Structural aluminum has a high thermal conductivity which increases the likelihood of size changes due to temperature variations. Thermal warping in construction equipment can cause severe structural faults. EXTREN® fiberglass structural shapes, by contrast, are insulators, providing low thermal conductivity and a significantly reduced thermal coefficient of expansion. Warping due to severe weather conditions is effectively eliminated, making the product a suitable aluminum alternative in extreme climates. Fiberglass is further suited to adverse weather conditions due to its inherent resistance to various corrosive media. Aluminum is prone to weathering from common conditions such as perspiration and humidity. The extruded shapes must be finished through anodization to create a protective patina that can improve the material’s elemental resistance, but aluminum is only ever selectively resistant and is always prone to galvanic corrosion. Fiberglass is resistant to an enormous range of corrosive chemicals and standard weathering effects. EXTREN® structural shapes are enhanced with a surfacing veil and ultraviolet additives to enhance the material’s performance in exterior applications. This makes it uniquely suited as an aluminum alternative for roofing structures and exterior paneling. DURADEK® and DURAGRID® grating products also offer superior resistance to acids, caustics, and salts. These agents can cause galvanic corrosion of aluminum grating particularly on mating surfaces, such as where handrails are bolted to the grating structure. Improving the corrosion resistance in these areas is critical for ensuring long-serving structural components that provide safe working conditions for employees with low maintenance requirements. Fiberglass is demonstrably superior to almost any structural metal in this area. Feel free to browse our Corrosion Resistance Guide for full details on the resistive capacities of our fiberglass products. Strongwell is one of the world’s leading suppliers of fiberglass products for construction and engineering. These aluminum alternatives have proven benefits for structurally-critical or aesthetic applications. If you would like any more information about our product range, please do not hesitate to contact us.